You might guess that I have a thing for books. I read books, I write books, I hoard books, I quote books, I can barely get through a conversation without bringing books into it in some way. So I have this friend who makes beautiful handcrafted books. (You can see her work at Pickle Bound Books.) Not only does she create these lovely books, she shares her talent and teaches other people how to do it as well! I attended her Oriental Stab Binding class this week, and it was amazing! I took a bunch of paper and some thread, and voila! 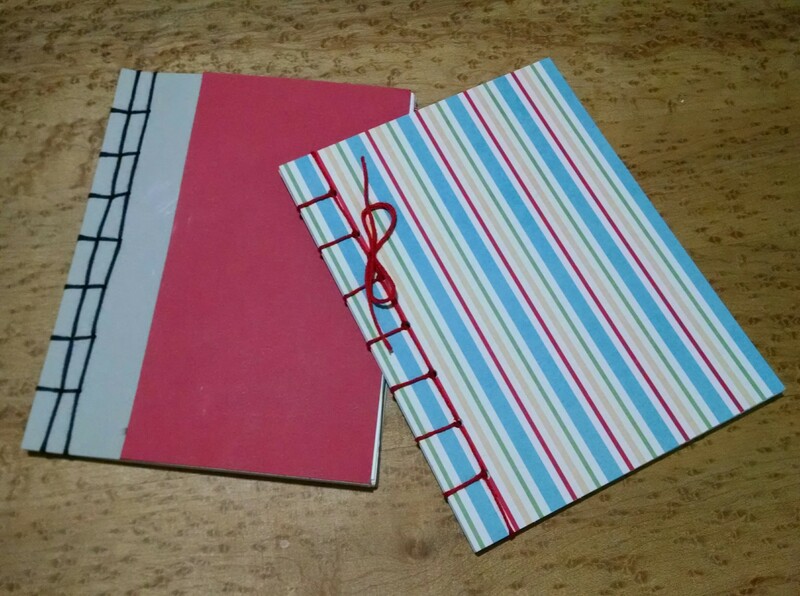 Have you ever tried your hand at book binding? Grab the opportunity if you ever have it. So much fun. I have a few tutorials saved on Pinterest on how to bind books. I want to do it so bad, but it takes a little more time than I have right now. lol These are cute! So cool! I think we bound books in second grade, or somewhere in that age range, as a project and then wrote our own stories in them. But as an adult I’ve never tried it. Sounds fun! Your books are so cute! Thanks! 🙂 Oooh, that’s giving me a good idea. Maybe I’ll devote them to short stories or writing exercises. Get some creativity flowing. Would you rather . . .